The multi-award winning Tiree Music Festival last night confirmed that Scouting for Girls will travel to the remote island to headline the ‘Best Small Event in Scotland’ as part of their 10th anniversary year. It is ten years since the band released their No.1 self-titled album that featured hit singles ‘Heartbeat’ and ‘She’s so Lovely’ – selling over 1 million copies worldwide. For TMF, this will be the 8th festival since its formation in 2010 that has seen the festival sell out every year and gain a reputation as one of the friendliest and most unique festivals in the UK. The festival will be held on the 14th – 16th July once again overlooking the white sands of Crossapol Bay. Joining Scouting for Girls will be legendary singer-songwriter Dougie MacLean for his second visit to the festival after his spine-tingling performance in 2014. Debuting at the festival will be one of Scotland’s most exciting new voices Siobhan Miller as well as Irish-Bluegrass sensations Jig Jam fresh from their USA tour. 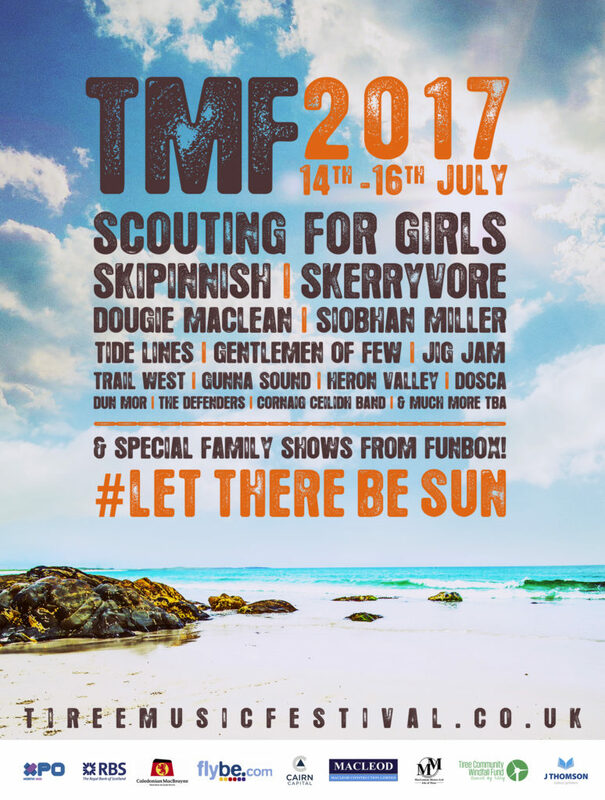 TMF wouldn’t be TMF without the Tiree strong contingent of Skipinnish, Skerryvore, Trail West, Gunna Sound, Dun Mor and The Defenders as well as a performance from legendary tutor Gordon Connell & The Cornaig Ceilidh Band. There will also be a special first birthday celebration for Tide Lines who performed their first ever gig at TMF 2016 and have gone on to take the Scottish music scene by storm. Families (and big kids!) will be delighted to know that Funbox will be returning to Tiree with their new ‘Highland Fling’ show and there will once again be a host of children’s activities and workshops throughout the weekend. All remaining tickets for the festival go on sale this Saturday (18th) at 12.00 (noon) and are available from www.tireemusicfestival.co.uk . Early bird tickets for the event sold out in less than 48hrs so early booking is advised.